The relay takes advantage of the fact that when electricity flows through a coil, it becomes an electromagnet. The electromagnetic coil attracts a steel plate, which is attached to a switch. So the switch's motion (ON and OFF) is controled by the current flowing to the coil, or not, respectively. 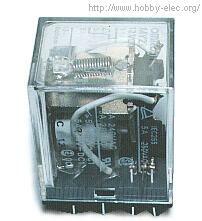 A very useful feature of a relay is that it can be used to electrically isolate different parts of a circuit. It will allow a low voltage circuit (e.g. 5VDC) to switch the power in a high voltage circuit (e.g. 100 VAC or more). The relay operates mechanically, so it can not operate at high speed. There are many kind of relays. You can select one according to your needs. The various things to consider when selecting a relay are its size, voltage and current capacity of the contact points, drive voltage, impedance, number of contacts, resistance of the contacts, etc. The resistance voltage of the contacts is the maximum voltage that can be conducted at the point of contact in the switch. When the maximum is exceeded, the contacts will spark and melt, sometimes fusing together. The relay will fail. The value is printed on the relay. Although the resistance and permissible voltage and current at the point of contact are indistinct, I think that it will handle several hundred mA. The relay on the right in the photograph can be used to control a 100 VAC system. Its driving voltage is 3 VDC, and if it is used to control an AC system, the maximum resistance voltage is 125 VAC, and the permissible current limit is 1A. If it is used to control a DC system, the maximum resistance voltage is DC30V, and the permissible current limit is 2A. It has one contact only. Both types of relay can be mounted on the PWB; the spacing of the component leads is a multiple of 0.1 inches. It can also be mounted on the universal PWB. 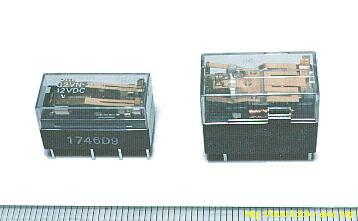 The physical dimensions of the relay on the left are width 19.5 mm, height 10 mm, and depth 10 mm. The one that is on the right has the width 20 mm, height 15 mm, and depth 11 mm. The relay pictured to the right is able to handle a little larger electric power. Its driving voltage is 12 VDC, maximum resistance voltage is AC 240V, and the permissible current limit is 5A in case of AC system. In a DC system, the maximum resistance voltage is DC 28V, and the permissible current limit is 5A. It has 2 contacts. This type of relay can not be mounted on the PWB. It needs a socket, and mounts on the case or some other place with a screw. The dimensions are width 22 mm, height 35 mm, and depth 20 mm.